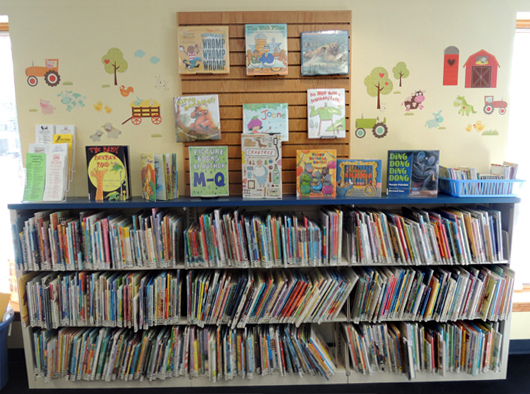 To modify a line from Tolkien, “Even the smallest library can change the course of the future.” This is absolutely true of the children’s room at the Mary Jacobs Memorial Library in Rocky Hill, New Jersey. It’s small, yes. But it is filled with books, fun, and sunshine. 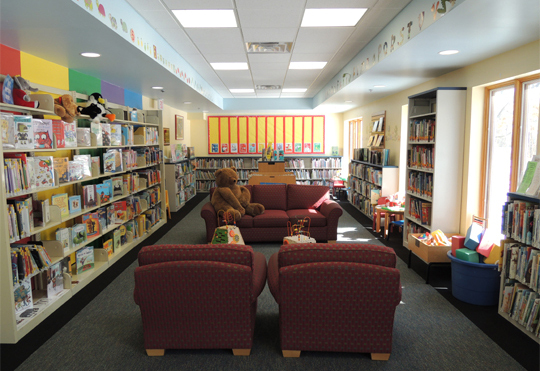 It’s the perfect place to instill a love of books in future readers. Here’s a bookshelf that’s just begging to be browsed. And look at those adorable wall decals! The staff update them from time to time to keep the room fresh and interesting. Decals are an easy, inexpensive, and non-permanent way to jazz up a space. The farm decals you see below, for example, are $13.99 on All Posters.com (and the company’s almost always running 15% off deals). 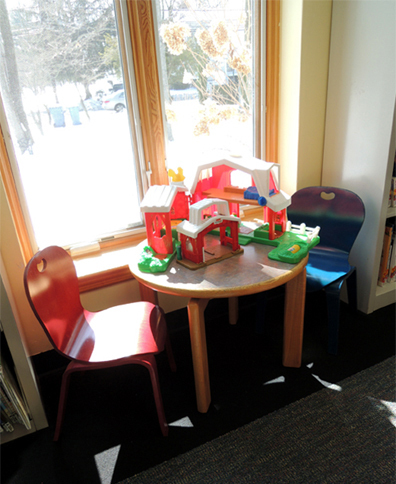 In addition to a big sofa and two comfy armchairs, the children’s room has three sets of kid-sized tables and chairs. They are nestled in front of the sunny windows, which overlook trees, grass, and the town’s main street. 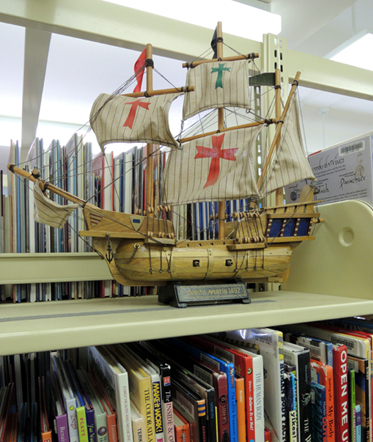 The children’s room also has toys for kids to play with. They’re kept in a centralized area that allows for quick and easy clean up. My kids are partial to the castle set, the giant foam blocks, and the vehicles. There are also activity towers for babies to explore. 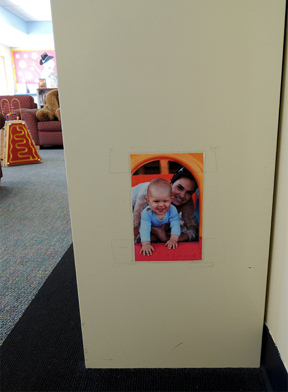 I call these “baby surprises.” Scattered throughout the room, at infant eye level, are images for babies to discover and revisit. Fantastic idea! 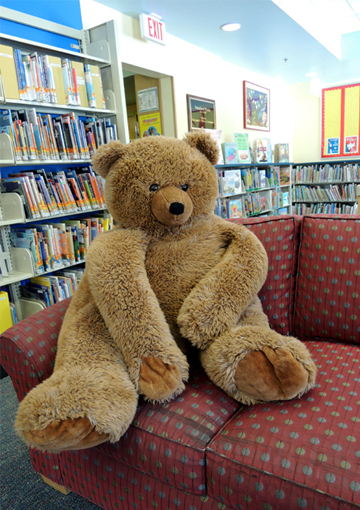 And don’t forget to give Brownie, the room’s resident bear, a big hug! 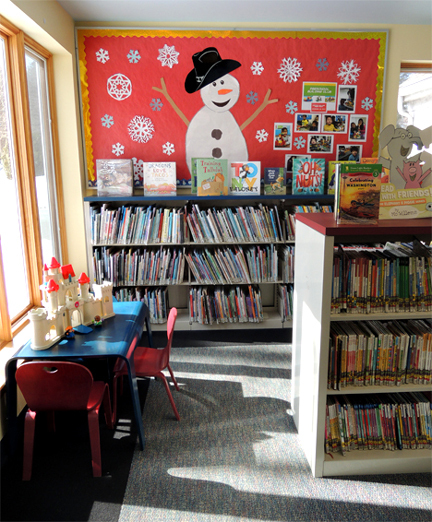 Outside the children’s room are shelves containing materials for older readers. There are awesome touches here, too. Like this fabulous ship. 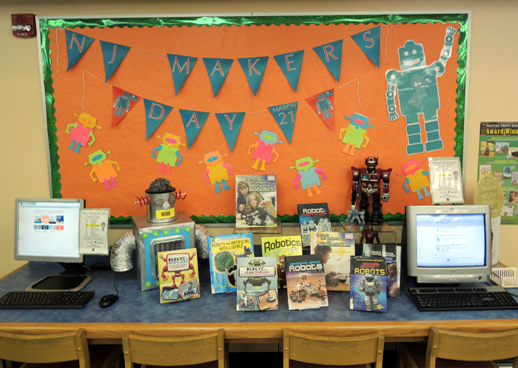 The staff change the library’s bulletin boards every month. 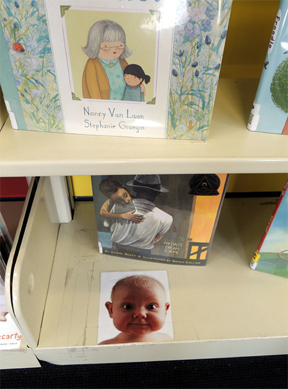 Sometimes, they’re seasonal, sometimes they’re thematic, and sometimes they’re matched to a library program. 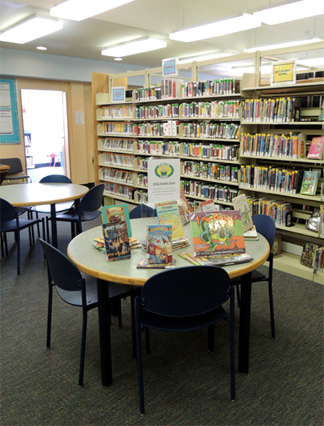 Often, the staff will post games like “Vote for your favorite Dr. Seuss story” or display kids’ artwork. Let’s get a closer look at that splendid box robot, shall we? I love everything about this guy. The steel wool hair, the tea strainer eyes, the plastic cup ears wrapped with pipe cleaners. 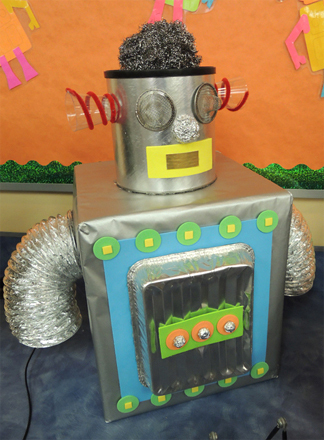 Youth services librarian Katie Winjum is responsible for this handsome fellow. She also does the bulletin boards and general decor. 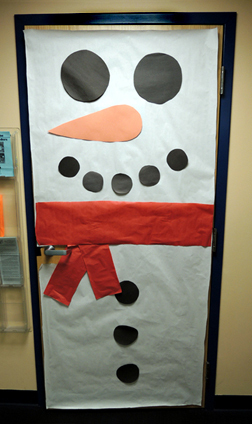 Like this super-sized snowman door. Fun! A few summer’s ago, when the library had a “Dig Into Reading” theme, Katie hand-rolled a zillion paper cone stalactites and attached them to the ceiling! The shelves were adorned with things like head lamps and gold bars (i.e., boxes wrapped in gold foil). I was seriously impressed. A tip of the crafting hat to you, Katie! I’m obviously not a professional photographer, but I sincerely hope the library’s welcoming atmosphere comes through in these photos. When you walk in, you immediately know that you’re invited to make yourself comfortable and read something wonderful. 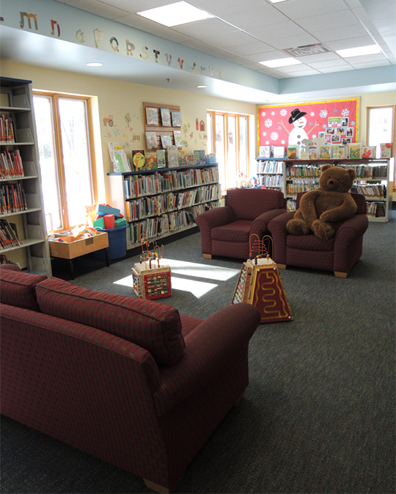 It’s the perfect place for little readers.